The Body Cam footage of a nurse being violent arrested for doing her job and refusing to break the law may be shocking, but it's not uncommon. However, while this incident was caught on video and spread like wildfire when it was released, it is not uncommon, and it does not apply solely to medical professionals. Police officers also have a history of targeting and abusing first responders rendering aid to citizens in life-threatening situations. When Capt. David Wilson, a veteran firefighter with 27 years of experience, arrived at the scene of a nasty car accident in Hazelwood, Missouri, in May 2003, he parked his truck and went to work. As he was attending to the victim, he was approached by a police officer who seemed to care more about the position of the truck, than about the survivors of the crash. When Wilson ignored orders from Officer Todd Greeves to move his vehicle, Greeves became agitated, and decided to take matters into his own hands. Greeves arrested the firefighter, and kept him detained by a patrol car for 23 minutes until a supervisor told him to let Wilson go. Wilson filed a civil rights lawsuit, and received $17,500 in damages. A similar instance occurred in March 2014 when a volunteer fireman in New Roads, Louisiana, was rendering aid to a woman who passed out in her home. He was the first one on the scene, and when police arrived, instead of asking about the state of the patient, they demanded that the fireman move his truck. When he did not comply, the officer arrested and detained him for nearly 15 minutes. In the same way that power-hungry police officers have gone after firefighters rendering aid to the victims of car accidents, they have also gone after paramedics and emergency medical technicians who did not follow their orders. In 2009, Oklahoma State Patrolman Daniel Martin pulled over an ambulance for failing to yield to his patrol car. The ambulance was in the midst of rushing to a hospital with a sick woman in its care. When the driver of the ambulance, Maurice White, stood up to Martin, the patrolman responding by assaulting, choking and then arresting White, while a sick patient waited in the back of the ambulance, in need of emergency medical care. Another police officer used the chokehold method when he got into a confrontation with an EMT in Portsmouth, Ohio, in February 2017. While the emergency medical technicians were preparing to move a man into an ambulance, after he was knocked unconscious during a fight outside of a bar, he suddenly regained consciousness. Police on the scene responded by intervening and deploying a taser on the startled man, and when one of the EMTs stood up the police sergeant, he assaulted the technician, putting him in a chokehold. A sheriff’s deputy also decided to interfere with an ambulance rushing a patient to a hospital Jackson, Kentucky, in June 2016. The ambulance driver claimed the deputy gave no reason for the stop, and the only reason the driver could come up with as to why the deputy would interfere was because he was the owner of a competing ambulance company. When a police officer in San Diego, California, decided to go after an EMT and a paramedic at a 7-11 convenience store in April 2014, the surveillance tape was their saving grace. Officer Anibal Solis claimed he heard EMT Derek Shubin call him a “F—king Nazi,” and he naturally grabbed Shubin and punched him. Paramedic Steve Cogle then intervened and put Solis in a chokehold. After Cogle let Solis out of the chokehold and tried to diffuse the situation, the officer proceeded to attack him. A former paramedic in St. Paul, Minnesota, found herself on the receiving end of similar treatment in April 2017, when she stopped to render aid to a man who was bleeding on the street. As soon as an officer arrived, the paramedic cautioned him not to touch a portion of the man’s shirt that was soaked with blood. The officer responded by punching and later arresting the paramedic for attempting to help. One of the most commonly used arguments for supporting police officers is that they risk their lives daily in order to save the lives of others. This same description can be used for firefighters, doctors, nurses, paramedics and emergency medical technicians. 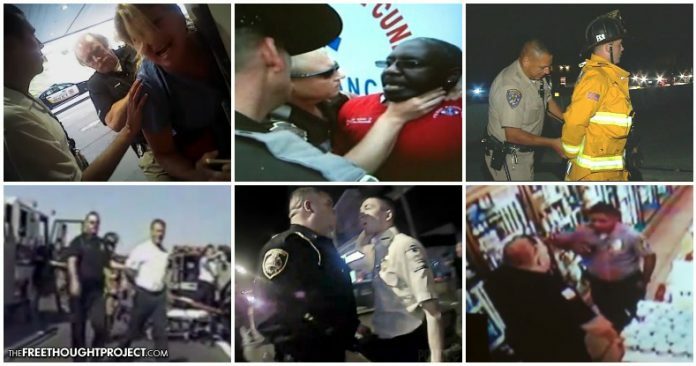 However, when police officers adopt an “It’s my way or the highway” mentality, and they abuse medical professionals and first responders who do not listen to their commands, they not only take away from their own credibility, they also risk the lives of individuals who are already in an emergency situation.